For AMAPCEO to be effective, it is vital that all members know their rights. The first step to being informed about your employee rights and the employer's obligations is to read and become familiar with your Collective Agreement. To better understand some of the more important provisions of the Agreement, AMAPCEO offers a variety of guides and fact sheets to make things simple and easy to understand. Don't worry—you don't have to defend your rights alone. It takes all of us to ensure that the Collective Agreement is upheld and propertly understood. This is why we have trained volunteer Workplace Representatives located in every bargaining unit and a professional team of staff to support you and provide additional information and advice. In fact, your Collective Agreement provides you the "right" to AMAPCEO representation by a Workplace Representative in certain circumstances. For more details, please see the Fact Sheet entitled "Right to AMAPCEO Representation". Union activity is your right. You are legally entitled to participate in a wide variety of workplace and union activity. Wearing union messages. Yes, you are allowed to wear stickers, buttons, lanyards, bracelets, and other items that convey AMAPCEO messages, as long as the messages are not derogatory or fraudulent. Read union literature. 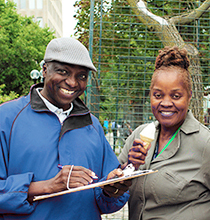 During non-working time, you can read and share information about campaigns and bargaining, as well as sign petitions. Talk about the union: associating is allowed and you are allowed to talk to other members about the union and its activities. This is especially important as it helps keep members informed. Leaflet before and after work. As a member of the union, you have a right to distribute information both inside and outside of the workplace. Desk drops. To improve our communications, yes, you are allowed to place union-related materials at members’ workstations. This can also provide opportunities for meeting new members, sharing updates on campaigns or bargaining, and recruiting new activists. Post information on bulletin boards. Article 13 in the AMAPCEO collective agreement obligates the Employer to provide reasonable access to bulletin boards so that AMAPCEO can communicate with its members. You are allowed to post information on the designated bulletin boards. If your manager is interfering with your right to participate in any of the above lawful activities, please contact a Workplace Representative. Section 5: Every person is free to join a trade union of the person’s own choice and to participate in its lawful activities. Section 70: No employer or employers’ organization and no person acting on behalf of an employer or an employers’ organization shall participate in or interfere with the formation, selection or administration of a trade union or the representation of employees by a trade union or contribute financial or other support to a trade union, but nothing in this section shall be deemed to deprive an employer of the employer’s freedom to express views so long as the employer does not use coercion, intimidation, threats, promises or undue influence. shall seek by threat of dismissal, or by any other kind of threat, or by the imposition of a pecuniary or other penalty, or by any other means to compel an employee to become or refrain from becoming or to continue to be or cease to be a member or officer or representative of a trade union or to cease to exercise any other rights under this Act. Section 76: No person, trade union or employers’ organization shall seek by intimidation or coercion to compel any person to become or refrain from becoming or to continue to be or to cease to be a member of a trade union or of an employers’ organization or to refrain from exercising any other rights under this Act or from performing any obligations under this Act. 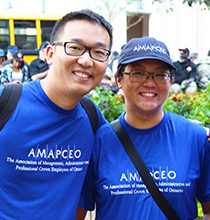 As a member of AMAPCEO, you are entitled to opportunities to get involved in the Association, as well as to take Association leaves. Read on to learn more about your rights as an activist. AMAPCEO activists in various roles may request or be asked to participate in meetings and are eligible for Association leave. Your right to Association leave is defined in Article 8 of the Ontario Public Service and can be found in all collective agreements of the broader public sector bargaining units. Q1: What is an Association leave? Generally, Association leave is intended to allow for your full participation in AMAPCEO meetings and trainings including the Annual Delegates' Conference, committee meetings, Workplace Representative training, bargaining meetings, and other business of the Association. AMAPCEO reimburses the Employer for your time away from your work while you attend the event, meeting or training, ensuring that you are not required to use credits to participate. Q2: How is leave defined for Association activities? Generally, these are various types of non-discretionary leaves with pay and with no loss of credits, in order for members to conduct Association business. Q3: What is the authority for leave for Association activities? Article 8 deals with leaves of absence for Association activities. It provides leaves to members for a variety of reasons, including: leaves for bargaining, Chapter Chair duties, training, education, Annual Delegates’ Conferences, and other business of the Association. Q4: What is the process for requesting Association leave? When you register for an eligible event or confirm attendance at a committee meeting, a designated AMAPCEO staff person will confirm your manager’s contact information and the time you are requesting leave for. A leave request must be submitted by AMAPCEO on your behalf to the Treasury Board Secretariat (TBS) – Employee Relations Division. TBS then informs your manager that AMAPCEO is requesting leave for you. In accordance with your Collective Agreement, AMAPCEO must send leave requests at least five business days prior to the leave commencing. Q5: What are my responsibilities as a member? You must accurately report your attendance in the Workforce Information Network (WIN) by selecting the appropriate box for paid Association leave. As a courtesy, you may also wish to notify your manager in advance that a leave request will be sent to them by TBS. Q6: Can my manager prohibit me from taking an AMAPCEO leave? Most leaves for Association activities are non-discretionary and thus a manager does not have any discretion not to approve it; they simply receive notice from TBS of the leave request. However, Article 8.4, leave for education (e.g. Workplace Representative Training), does state that the Employer “shall grant time off...unless such time off would impair operational requirements”. Your manager’s decision does have to be reasonable to deny any such request and the Association will work to ensure members can reasonably access leaves. Q7: I live outside of Toronto. Does AMAPCEO cover travel time? Association leave is granted where work time must be missed to a ttend the Association activity. Travel time must be approved in advance.